Not sure since when, many articles claimed that cactus has become a popular dish in many occasions since it is easy to cook. Its stem can be eaten chilled with some additions of salad dressing. It can be fried or stewed, besides cooking in the soup. But, today, I am going to focus just on soup cooking because the soup tastes a real good! As for the taste of the Cactus, if you are going to eat it as well, no worries, it taste pretty bland and the texture resembles cooked cucumber. It’s crunchy to chew. And so, what does it help? I read the articles claiming that cactus helps to promote good digestive system, improve immunity, strengthen bones and joints, invigorate blood circulation, detoxification of the body system, and etc. Some even claimed that eating cactus helps to improve in obesity due to its rich supply of Amino acids that balances up the body system, and hence, increases metabolism. And don’t forget, it’s low fat green food, too. Bring a pot of water to a boil over high heat. Place in all ingredients and bring it to a boil again. Then, reduce heat to low fire and simmer for at least 2 hours, with lid on. Add in salt and stir well. Continue to simmer for another 15 minutes before heat off. Serve hot together. Place all ingredients in a croak pot. Then, place croak pot into slow cooker, cover with lid and cook for at least 4 hours on auto or low shift mode. Add in salt and gently stir to combine. Let the soup cook for another 20 minutes before serve. A regular bowl of soup counts about 60kcal. 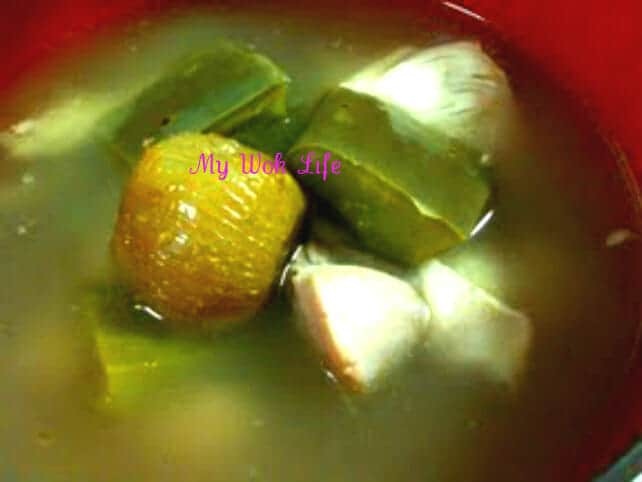 Since, this is a soup with both the protein and greens in it, cook this as your easy one-dish-meal… Eating with one portion of chicken and cactus in the soup, it counts merely 120kcal. Tips: The edible cactus is nice to eat. Simply peel off the thick skin using a peeler or small knife. Place cactus flesh in a bowl. Gently scour with salt and leave for 5 minutes before rinse off and add into cooking (Skin is not edible). * For the real diet-watcher, use skinless chicken breast meat to cook the soup. Very knowledgeable and interesting. Nice to know.